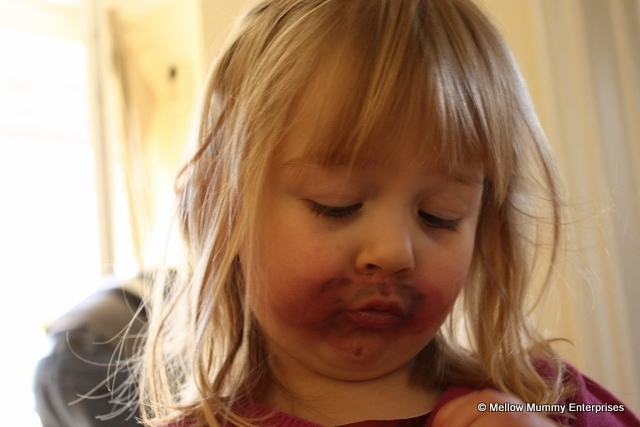 I am sure that the lipstick-all-over-the-face event is a right of passage in a little girl's life. I know I did something similar as a child and I'm sure little girls the world over do it. 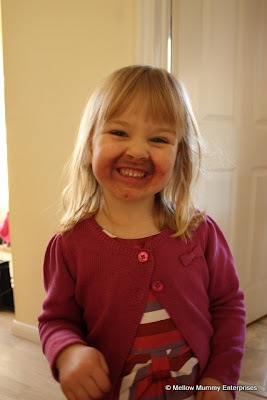 This weekend I discovered Lara upstairs helping herself to the contents of my make-up drawer. She has never shown an interest before which is why we had never felt the need to put a drawer latch on it. She tried to hide what she had been up to but the face kinda gave it away, don't you think? I congratulated myself on how calm I remained. I wasn't angry at all; in fact I thought it was hilarious! I was also slightly alarmed that my very first instinct wasn't to rub it off, but to explain to her how she had got the mascara wrong!